In the first of a series of nationwide round-table dialogue events financed with support from EUAM, staff from Ukraine’s National Anti-Corruption Bureau (NABU) engaged today with regional journalists in Odessa to discuss the fight against corruption in Ukraine, and specifically the agency’s own role. 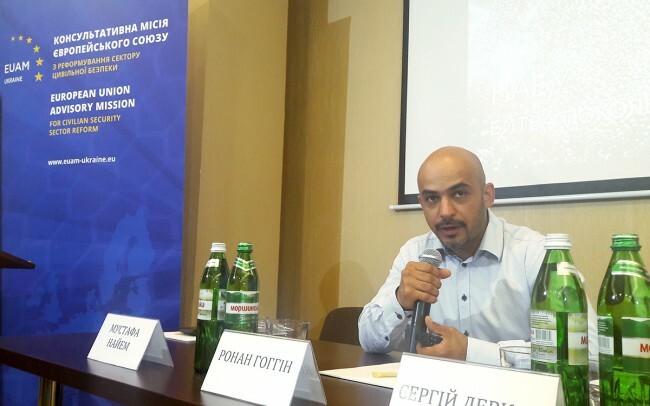 Among those to address journalists were the First Deputy Director of NABU, Gizo Uglava, and Member of Parliament and journalist, Mustafa Nayem. As part of Ukraine’s reform process several new anti-corruption agencies have been established in recent times, with NABU being the first to begin operations. However, members of the public in Ukraine are often unaware of what functions each agency performs, and what they can expect from NABU in helping to fight corruption. The round-table dialogues are endeavouring to bridge that gap. Apart from journalists in attendance, the round-table dialogue was also streamed live online, with speakers taking questions via the internet. EUAM and NABU will carry out the second round-table event for journalists in Lviv region towards the end of August, followed shortly afterwards by events in Kharkiv and Kyiv. EUAM is also supporting the production of an explanatory video for NABU as part of the project. NABU is stepping up its awareness-raising activities via its Department of External Communications, as it also opens regional offices in Odessa, Lviv and Kharkiv.